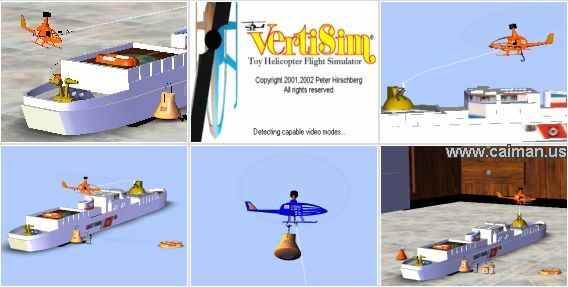 Caiman free games: VertiSim by Peter Hirschberg. VertiSim is an outstandingf 3-D simulation of the immortal Mattel toy from the 1970s, the Vertibird. If you had one of these as a kid, you`ll especially appreciate this program. This simulation placed first in the GameDev.net Physics Contest.. Since it is a simulator there are no points to score. There is nothing to shoot and no puzzles to solve. 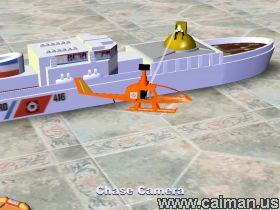 It is YOU flying the helicopter. You can`t even crash VertiSim simulates this toy extremely well. In addition to simulating the Vertibird, this program also has the added twist of being able to place the pilot inside the helicopter cockpit. The only way to get a genuine feel for this program and all its options, is just to download this simulation and try them all out for yourself! 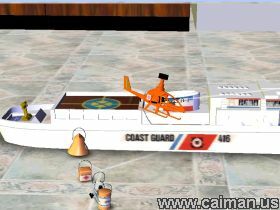 Rescue Ship Add-On (Size = 2.5 MB Install) .